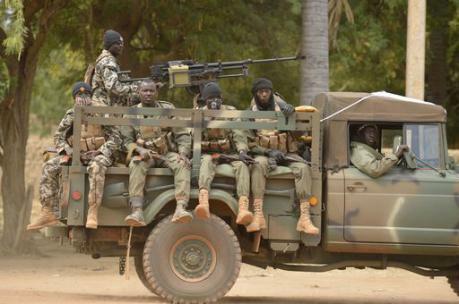 The campaign in Mali is not over but France has already opened a second front in Niger. It is obvious to everyone that a rapacious French imperialism intends to re-colonize the entire area of the Sahel. As in Mali the excuse is to clear the ground of jihadist terrorism, to provide stability for friends, and to stand up as a champion of democracy against the totalitarianism of Sharia law. In fact, the real goal is not stated, the exploitation of energy resources and strategic raw materials in the area, but it is being pursued with all the strength and determination the Hollande government can muster. Behind the usual lies, there is another factor speeding up Paris’ military and political moves: the Chinese presence. In Mali, for example, Beijing’s imperialism is as discreet as it is invasive. It has used its “soft power” to lay its hands on building projects, on the transport infrastructure, and has created a number of companies producing light goods and tools. It has also founded textile factories, using local labour, paid well below that at home, it is to be found in the production and refining of sugar and in pharmaceuticals. It has a presence in Chad and Sudan, extending its influence to many of the countries of the Sahel. For Niger, the situation is exactly the same, the only difference being that in its subsoil, as well as significant oil reserves, there are the world's third-largest uranium deposits, controlled by the French multinational, Areva. On 4 January 2012 the Chinese Foreign Minister Yang Jiechi, was received In Niamey, capital of Niger with full honours. He had a long and fruitful meeting with his counterpart, Mohamed Bazoum and the President of the Republic of Niger, Mahamadou Issoufou. The official visit ended with the signing of two important agreements on economic and technical cooperation, and on food aid, for which the country has a strong need in order to prevent popular unrest and riots which, given the international economic crisis, especially in these latitudes, are always on the agenda. Since 2001, China has been committed to carrying out a number of economically strategic infrastructure projects. The first is the development of inland connections to the second bridge over the Niger River in the capital Niamey, called the China-Niger Bridge of Friendship. It built the most important and modern hospital in the entire country and some roads linking the capital to the most important local centres. It built schools, set up a pilot project for lighting using solar power and supplied the country with tons of medicines, medical equipment and computer equipment for government offices. This has allowed China, not only to establish a significant garrison in Niger, but also to have some diplomatic leverage in the issuing of as many as 70 licenses for drilling wells in Niger. But the main thrust of this cooperation is represented by the Agadem integrated oil project which came into operation on November 28, 2011: with the China National Petroleum Corporation (CNPC) and its refinery at Zinder (Soraz) exploiting the Agadem oil fields in the far north-east of Niger, in a new joint venture company with Sino-Niger mixed capital. With this, the Niger will make a “quantum leap” in the international oil scene under the umbrella of Chinese imperialism. Currently, oil production is 20,000 barrels per day, of which only 7,000 remain in Niger and the remaining 13,000 are exported. The ambition of President Issoufou, thanks to Chinese technological assistance, is to raise production to 80,000 barrels per day in the early months of 2014, of which 60,000 will be for export. Not only that, the next Chinese move threatens the French semi-monopoly in the exploitation of gold mines and oil fields. These are small in size and proven reserves, but important enough given the international energy hunger for new sources, to cause wars in the recent past which have still not fully ended. Last but not least, Beijing’s "selfish charity" has managed also to gain concessions for the exploitation of some uranium deposits. This has alarmed the government in Paris. China’s advances in terms of exploitating uranium from Niger, started as “far back” as 2006, with the first award of Tegguida, and continued in 2007 with the establishment of Sino-Niger Somina for the use of a second field, at Azilik in the Agadez. It came to fruition in 2008 when Peking became the leading investor in uranium mines in Niger, surpassing the substantial French financial investment and forcing Paris into a frantic financial scramble in order not to lose too much ground against its Asian imperialist rival. After about a year of the pilot experiment, the first shipment of uranium to China started on October 30 2012, with plans for an increase in its share of production to 5,000 tonnes by 2020, equalling that of its French rivals, who, in line with an agreement with the government in Niamey, renegotiated on 5 January 2009, a contract for 35 years of exploitation of the deposits of Imourare at 5000 tonnes per year. Until then, the French multinational Areva (90% French capital), operated these fields as a monopoly to meet 40% of its uranium needs in civilian terms for its nuclear power plants and in military terms for its nuclear weapons. Currently, however, the situation is changing dangerously for French interests. The Chinese presence not only is gradually eroding Paris’ room for manoeuvre and its economic and strategic interests, but is likely to call into question the whole project, so dear to French imperialism, of re-colonization the entire area of the Sahel, both in economic and political terms for strategic control of “its” former colonies,. Among the other states, there is interest in getting hold of the oil reserves of Chad and Mauritania. They have just signed agreements for exploration and eventual drilling. Total as always, in collaboration with Russia's Gazprom, is planning a 4,000 km pipeline from Nigeria that connects to Algeria’s system to reach Europe via Spain or Italy., therefore, The timing and the arrogance with which the French war machine has staged the last two episodes of the war in the Sahel is not surprising, just as the same behaviour was not surprising in Libya against Gaddafi's government to make room for Total Fina in the oilfields, getting in ahead of its Mediterranean rivals, including Italy’s Eni. It is a banal truth to say that these episodes are the “normal” outcome of imperialist conflict between two aggressive competitors in sub-Saharan Africa, but it is also true that the devastating global crisis has produced a criminal acceleration of conflict over economic and strategic interests. The global crisis has further narrowed the profit margins of capitalism, of the real capitalist economy. It has encouraged speculation, the creation of huge masses of fictitious capital that then exploded in the very economy that had generated them, with the result that the world proletariat is crushed under the weight of a social butchery without an end in sight. It also shaken the major imperialist powers who, in order to pursue at all costs, the aim of the survival of their economies, have justified even the violence of war, and produced human and environmental disasters everywhere just to get a minimum of economic advantage. This is the tragic picture that capitalism presents every day. The crisis has put millions of workers on the street. Capitalism has called on them to pay the costs of its survival. Imperialist appetites and criminal aggression have revived. Yesterday we had the episodes of Iraq and Afghanistan, today it is Mali and Niger, tomorrow we can expect war to break out anywhere if it has an economic, strategic or “only” some geo-political value. The “collateral damage” will then be hunger and misery for whole peoples, hyper-exploitation of the proletariat involved, galloping unemployment equivalent to a process of uncontrollable pauperisation, imperialism has no interest in them neither now nor in the future. If imperialism has an interest in anything it is in capturing the anger and despair of the dispossessed that capitalism has produced, and dragging them back to the ground of its own interests, in the name of democracy, under the banner of nationalism, both in secular and religious forms, for a “just” war on terrorism and for freedom of peoples. In doing so, imperialism would not only provide itself with the usual cannon fodder, the same that, in normal times, serves as a tool of exploitation for its capital, but it would also, and this is not a secondary issue, make it more difficult for any class response to itself and that capitalist system which has continuously generated it.